A small bedroom can present homeowners with a unique set of design challenges. 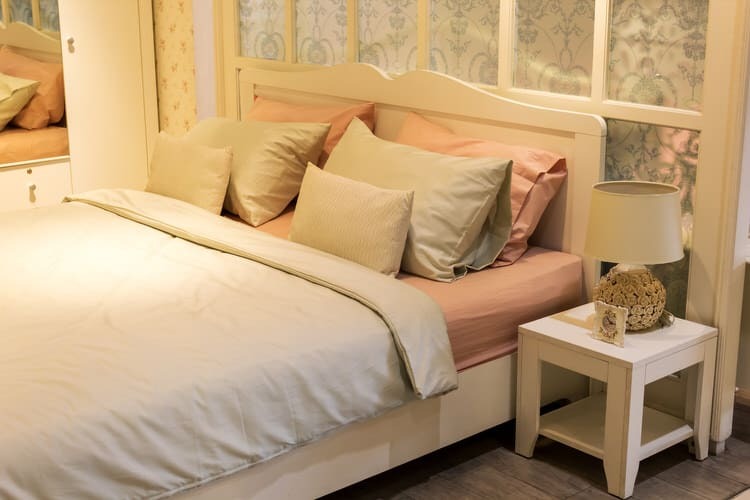 Cramped quarters, if not designed properly, can give a bedroom a messy, chaotic and claustrophobic feeling—not very conducive to getting a restful night’s sleep. 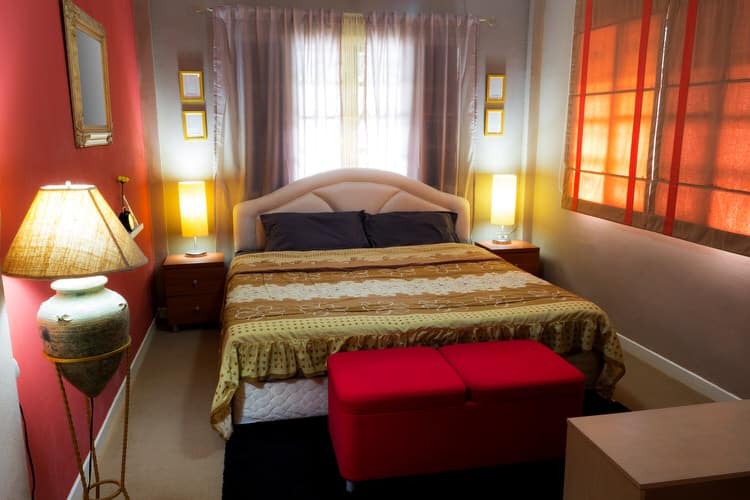 A small bedroom with an awkward and sloppy design can even negatively affect your love life. 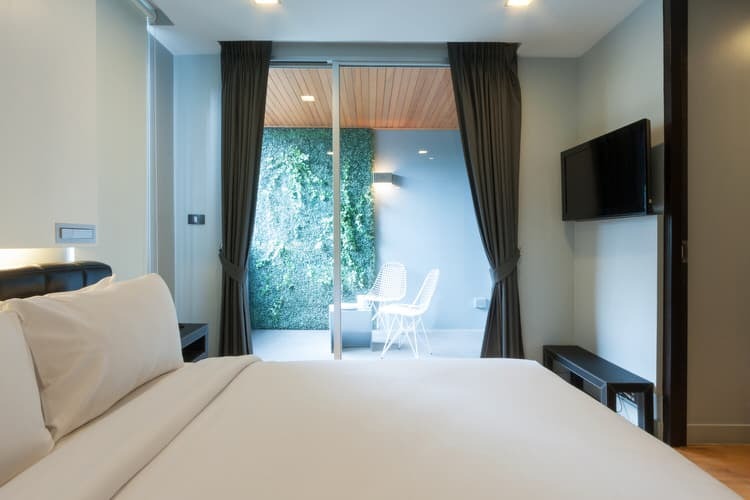 Believe it or not, it is quite simple to make the most of a small bedroom by using a combination of proper space planning, color, lighting and furnishings. Remember, a small bedroom need not be a boring bedroom. If your furnishings and belongings don’t fit in the room, it probably means you don’t need them. That is a good philosophy to live by when your small bedroom has limited storage and floor space. Try thinking within the confines of your space and create storage where there was none—like the long floating cabinet running along the head of the twin beds. Even small rooms can handle big impact like an attention-grabbing focal point that brings the elements of the room together and establishes order. Often the focal point is the head of the bed, which can be amplified with an artful arrangement of pillows in varying heights and colors. 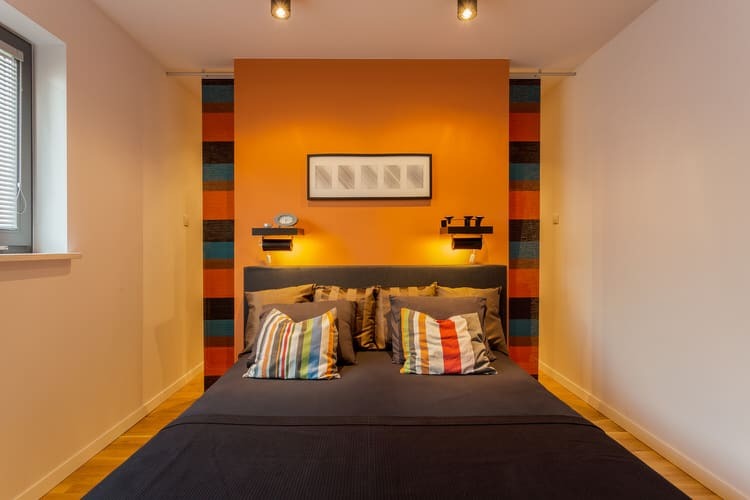 In this small bedroom, the homeowner gave the wall extra importance by using a combination of stripes and a coordinating orange color. An oversized mirror reflects light around the room, making the space appear larger. The horizontal mirror above the headboard adds depth and dimension, and in some cases can even make the wall appear to recede. Adding a few other small pieces in the room can trick the eye into thinking your tiny bedroom is larger than its actual dimensions. 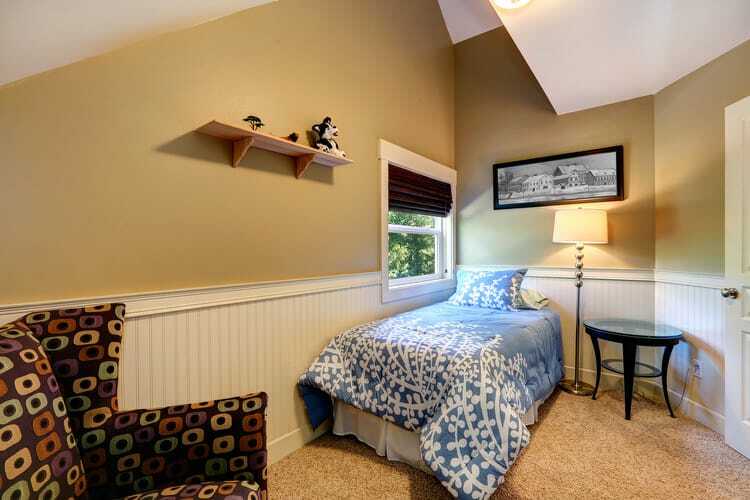 The use of a twin bed placed up against the wall frees up floor space for the desk and small lamp table. The furniture in this room is lightweight and leggy, so it doesn’t occupy as much visual space. Use one bold element to fill your small bedroom to the brim with character and style. This carved white headboard creates plenty of interest on its own. 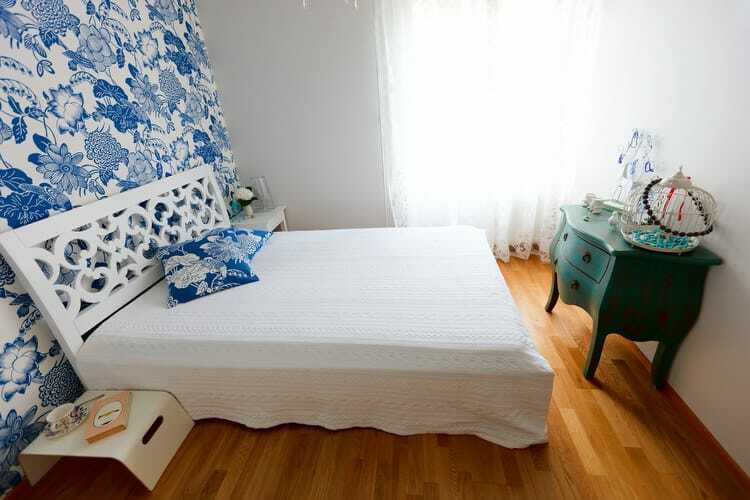 Pair it with the blue and white floral wallpaper, and it gives the room personality-plus! Continue the theme by using decorative pillows in a companion print. Niche shelving is sometimes too shallow to be useful for storage, but these niche shelves are the perfect size to house bedside items in this small bedroom. To keep surface clutter down to a minimum, consider using baskets or coordinating cloth boxes to corral smaller items. 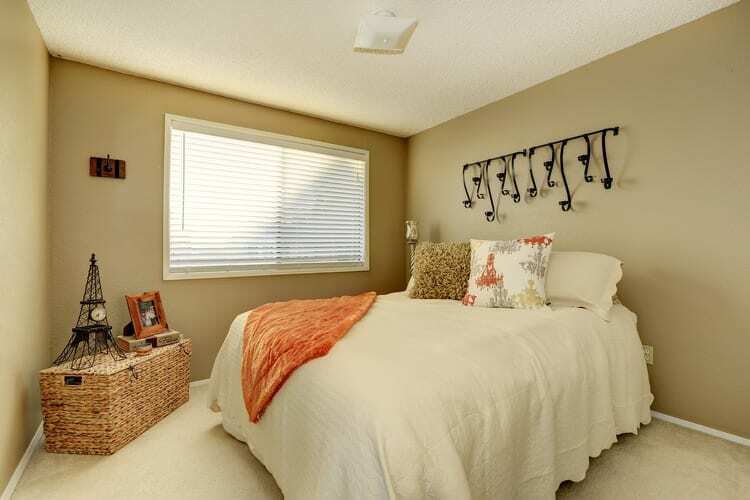 A great way to handle space issues in a small bedroom is to create the illusion of depth. 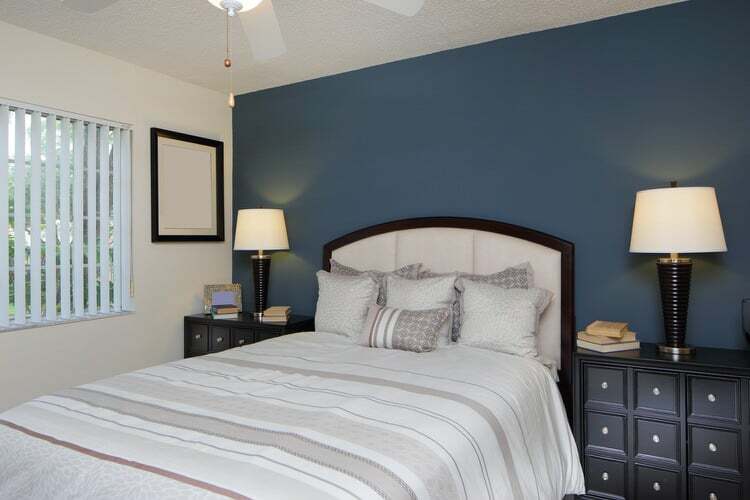 Paint one wall—preferably the headboard wall—a dark color to visually push the wall back, making it look much larger. 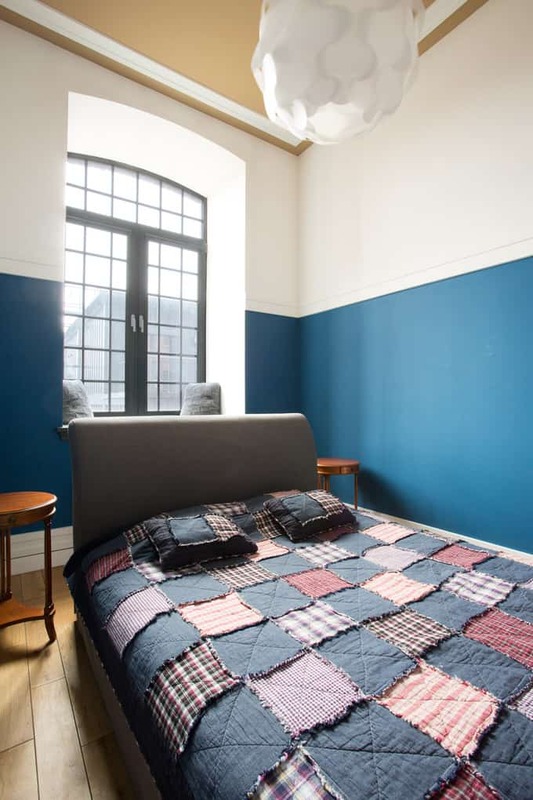 Crisp white walls and neutral striped bedding add a striking contrast to this bedroom’s navy blue wall. The dark nightstands reinforce the wall color. 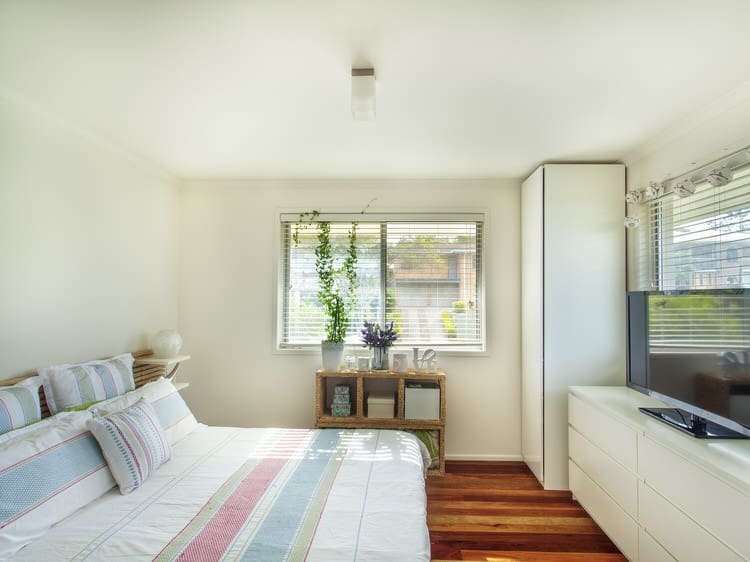 Here are some great ideas to make your small bedroom really special. Choose your favorite colors for walls and bedding like this symphony of purple. A combination of purple paint, wallpaper and duvet cozy up the space. Add interesting lighting like the sconces and table lamps. Include a statement headboard—the integrated headboard and side tables look fab, but the upholstered panels above really complete the space. Ahoy matey! 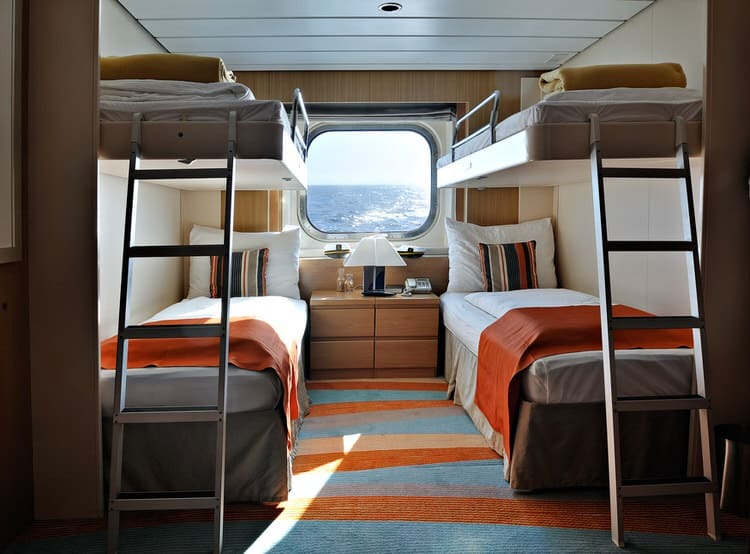 This nautical bedroom is the most efficient use of space we’ve seen in a long time. Within a very limited footprint, the designer managed to squeeze in four bunk bed, plenty of cabinet storage and two shelves. 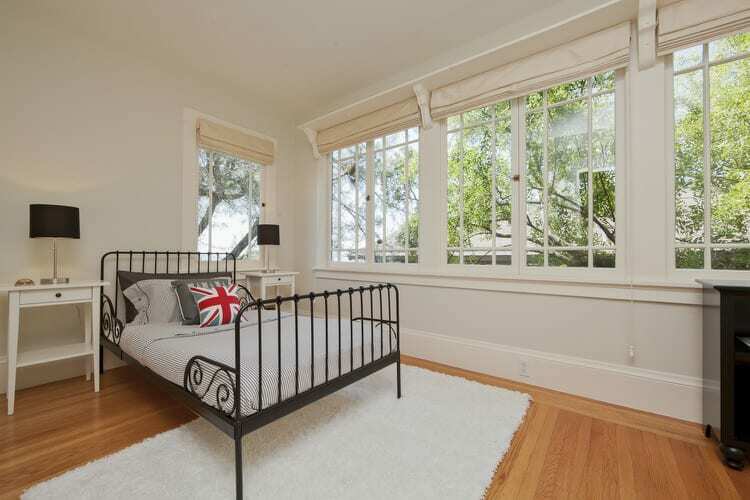 The window opens up the room, giving it a light and airy feel. The focal point in this room is the bed itself. 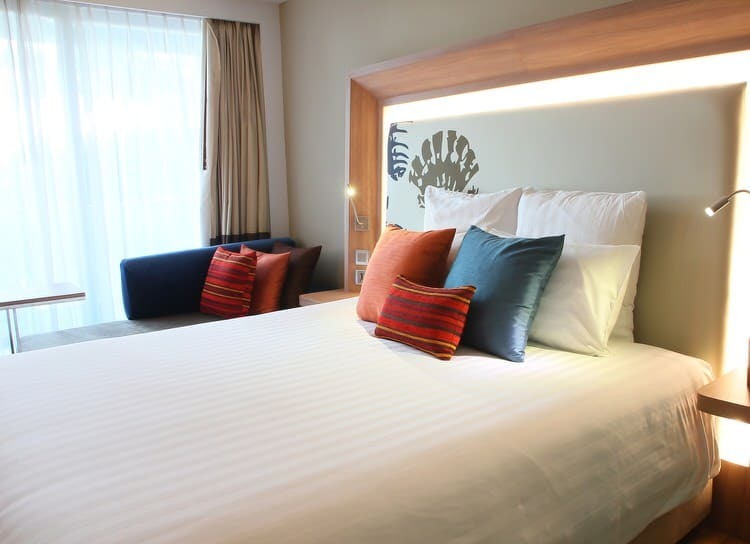 It may seem contrary to logic, but using a big bed in a small bedroom can actually make it seem bigger because of its horizontal lines in the space. 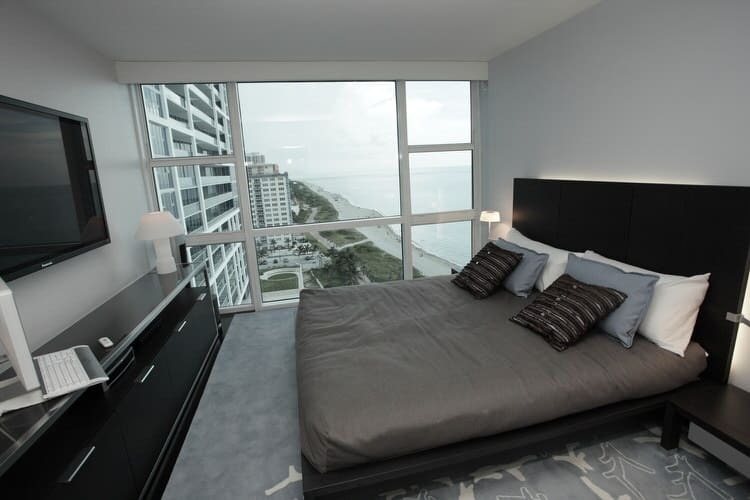 In this example, the far side of the room has floor to ceiling windows creating a sense of space. When combined with the clean, low lines of the other furnishings, the room actually feels expansive. Don’t think your tiny bedroom is destined to be boring. 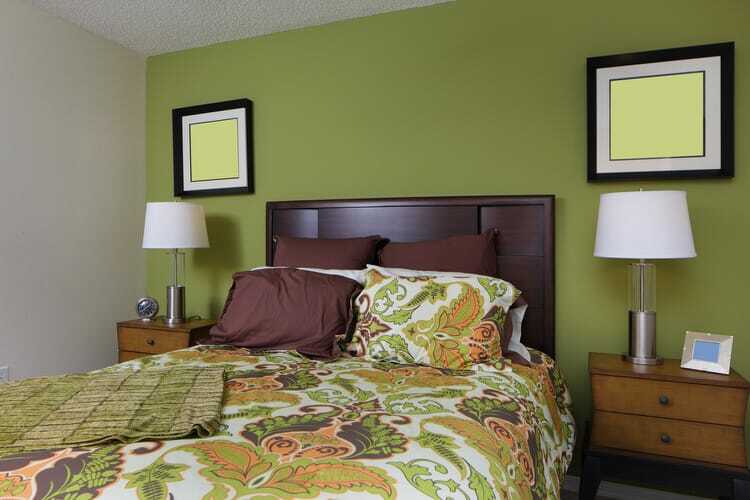 Painting a small bedroom in a cheery color creates big impact. Use a three-tone palette, like the green, gold and white in this room. 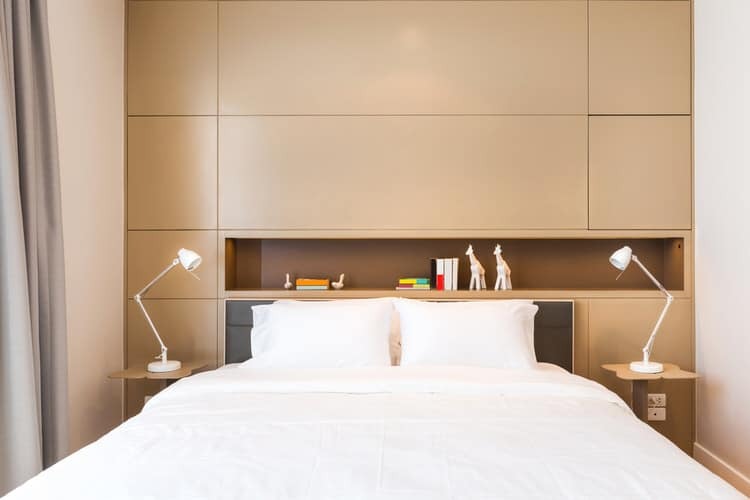 Furnish it with clever bedside storage pieces and use metallic accents like the lamps, an alarm clock and picture frame. A few coordinating accessories like pillow shams and a throw are the coup de grâce. Most small, older homes lack decent storage space. That’s why you need to be smart when looking for furniture pieces that provide ample storage in a compact space. In this small bedroom, the slim profile four-drawer dresser is perfect for folded clothing and even bed linens. The wardrobe, while narrow, is tall enough to accommodate a two-tiered hanging system to double storage space. 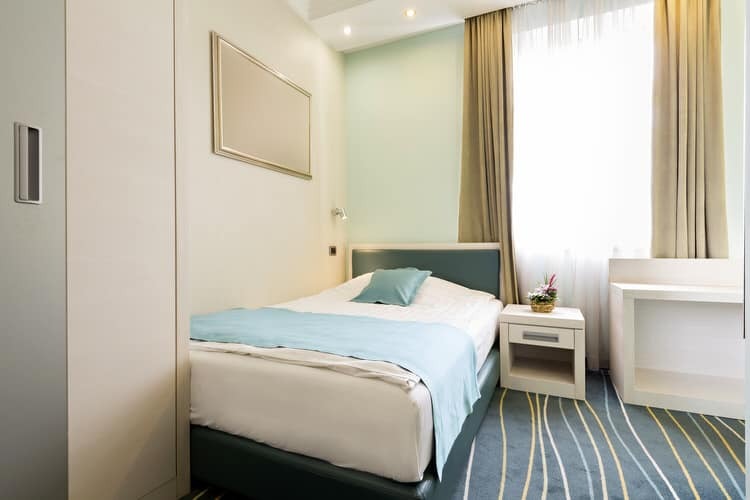 In extremely small bedrooms, place large furnishings around the perimeter of the room to avoid encroaching on floor space. A nifty was to achieve the look is to find pieces that match the wall color so they fade into the background. And by all means, keep accessories to a minimum! 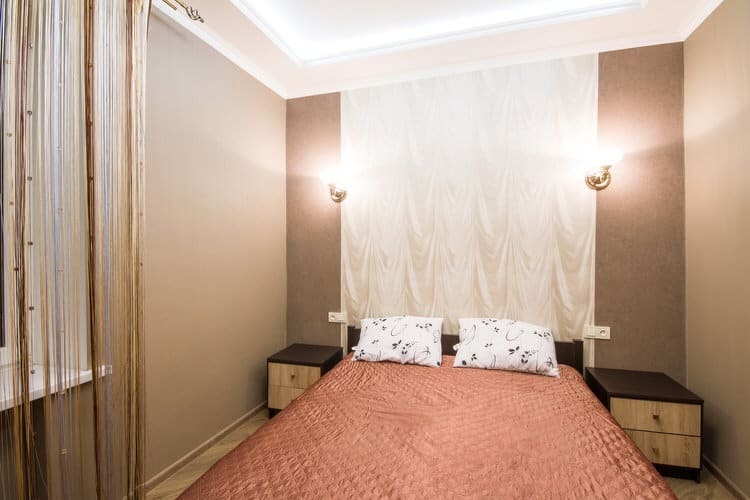 This small bedroom borrows from hotel design. Hotels make the most of everything in a room including mirrors. The mirrored vertical wardrobe gives the space a sense of height. The corner vanity can be seen from almost every vantage point. It reflects light from the window on the opposite side, giving the room a sense of depth it would not have otherwise. This small bedroom has an open and tranquil feel, thanks to the minimal furniture, neutral color palette and lack of clutter. 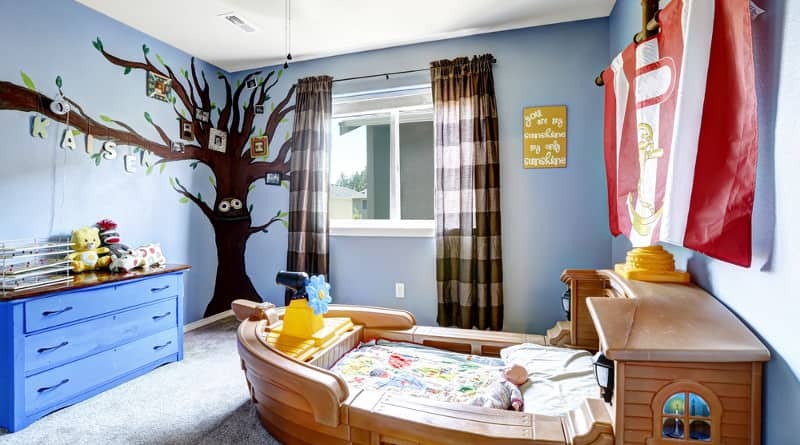 The homeowner knew she needed to find one art piece to create impact, rather than filling up the walls with smaller art. The curly iron votive holder creates the illusion of a headboard and picks up the tones of the accessories on the corner wicker chest. We know you might be tempted to buy the largest bed possible so you won’t have worry about putting anything else in the room. But doing that in a small bedroom can result in a closed in feel. This bedroom features a small-scale iron bed with a headboard and footboard you can see through. Instead of making the room feel congested, it literally opens up the space. 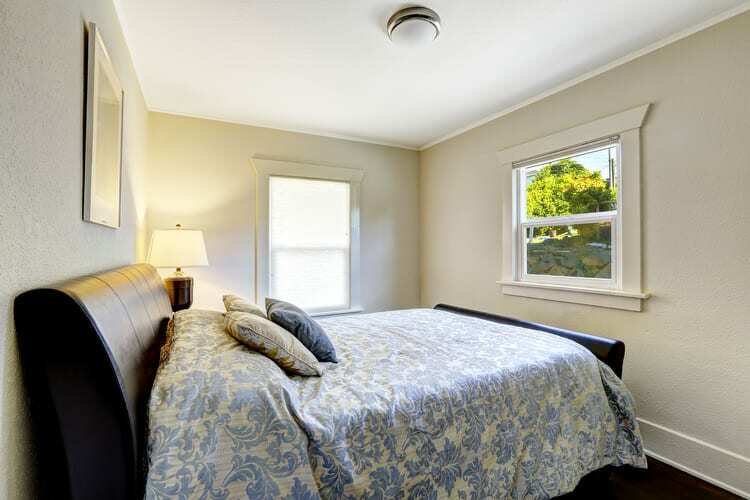 In this small bedroom, the owners capitalized on the architecture of the window by using it as the room’s focal point. 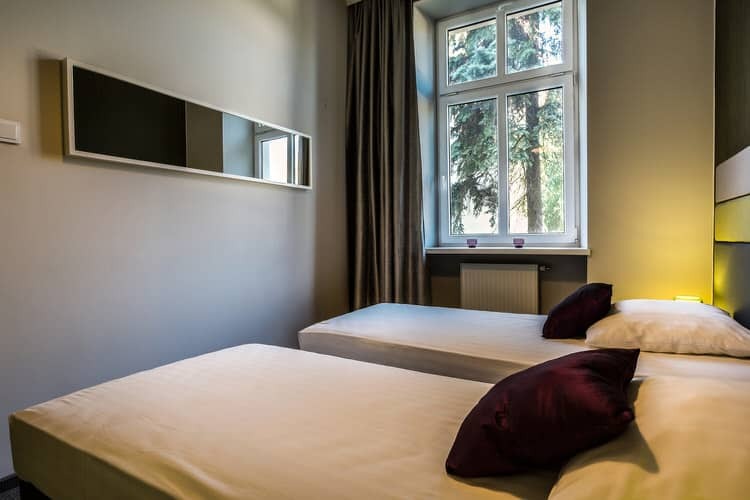 Conventional wisdom has always told us to position a bed against a solid wall, rather than in front of a window to avoid blocking light and views. But in a small bedroom, that’s difficult to do and we think it’s fun to break the rules once and a while! Any kind of storage in a small bedroom can maximize efficiency and take full advantage of every square inch of space. All it takes is one little spot to open things up and add to the room’s function. The nightstand in this bedroom offers surface area and open storage below for books or other small items. Become a magician and create the illusion of space in your small bedroom. Use color on all four walls and limit colors everywhere else. The warm gold on the walls becomes the perfect backdrop for the pair of floral paintings. The puffy white comforter gives the room a sense of airiness, making the room feel larger. This integrated headboard/focal wall is a custom look we just can’t get enough of. In a small bedroom with limited space, a mix of built-in storage could be the answer to all your problems. The combination of open and closed storage cuts down on clutter and displays a minimum of accessories. Painting the wall in a warm but neutral color lightens the whole space giving it a sophisticated touch. Great for OCD types like us! A limited (or in this case, lack of) a color palette also creates a sense of space and tranquility in a small bedroom. Color translates to visual noise and can be disturbing to some personality types. 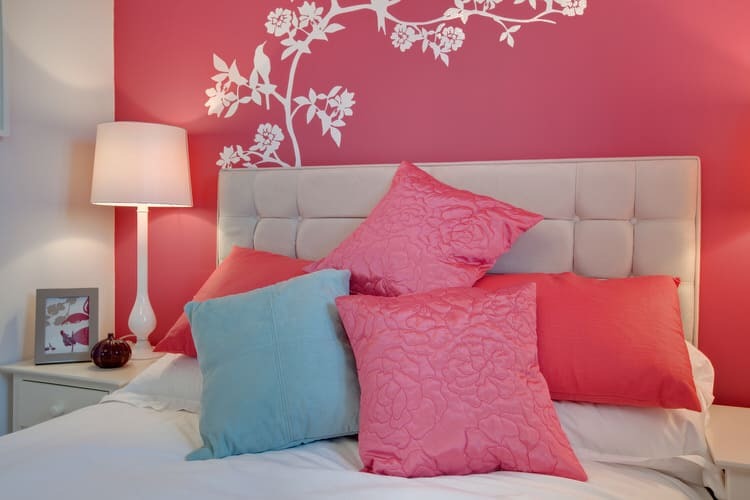 If you use the same neutral or pastel hues on walls, bedding and furnishings, your room will look larger. We promise! On the other hand, you might fancy a dark and cozy space in which to hibernate. Make your small bedroom dramatic by injecting rich, saturated colors. Bring in subdued lighting and install window sheers in complementary earth tones to add a warm glow to the room. Consider using beadboard in your country, rustic or traditional retreat. In this small bedroom, the homeowner installed white beadboard paneling as wainscoting around the perimeter of the room. The effect adds texture and contrast to the attic room, as well as creating a sense of space by forcing the eye to move around the room. 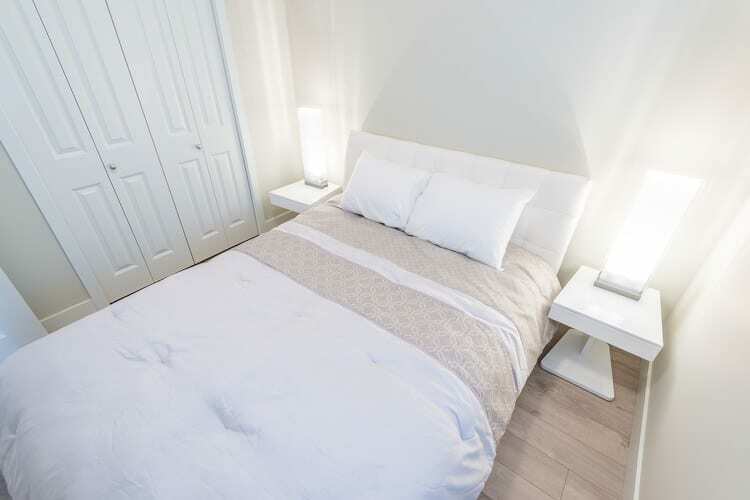 White-finished furniture and light wood tones will visually expand a small bedroom. A monochromatic design where every surface is a light, similar color—like in this petite bedroom—allows one element to blend into the other tricking you into thinking you’re viewing everything as one large space. If you have a piece of fabric that you want to show off, try using it as a wall hanging. It’s a wonderful way to enhance the drama of your small bedroom. In this space, a large panel of vintage Irish linen serves as an eye-catching backdrop against the coppery headboard wall. Everyone knows that wearing vertical stripes makes you look taller. Well, it works the same for a small bedroom. Use stripes to draw the eye toward the ceiling and give the impression of more space. 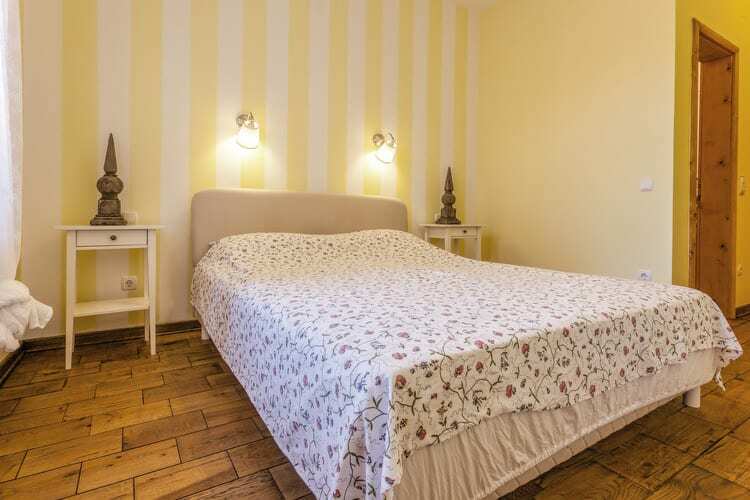 As you can see, wide vertical stripes in this bedroom do the trick. The designer/owner of this bedroom wanted created a spacious, soft and serene haven. She works with color all day, every day and wanted to give her mind and eyes a rest. She used a light peach paint on the walls and layered the room with luxurious fabrics in rich, neutral colors. 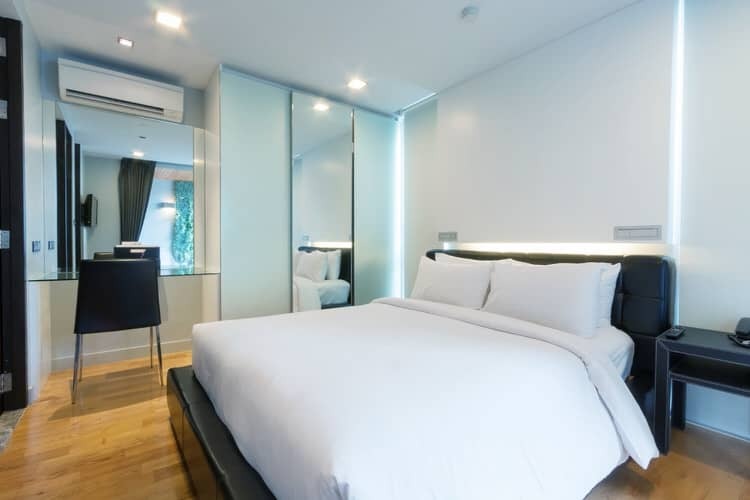 She also added a massive mirror on one wall to visually double the small bedroom’s footprint. This small bedroom makes the most of color and texture to create a grand presence. 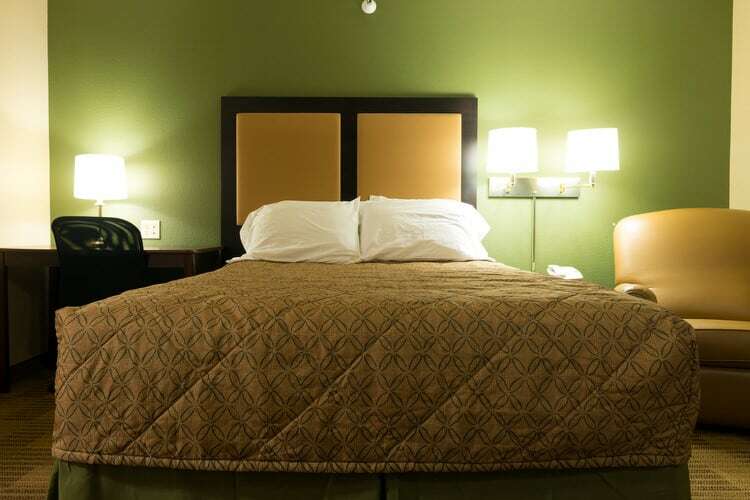 The classic velvet and wood upholstered headboard really pops against the mossy green wall. A side chair and combination desk-nightstand complete the space without overwhelming. Let’s help this small bedroom. 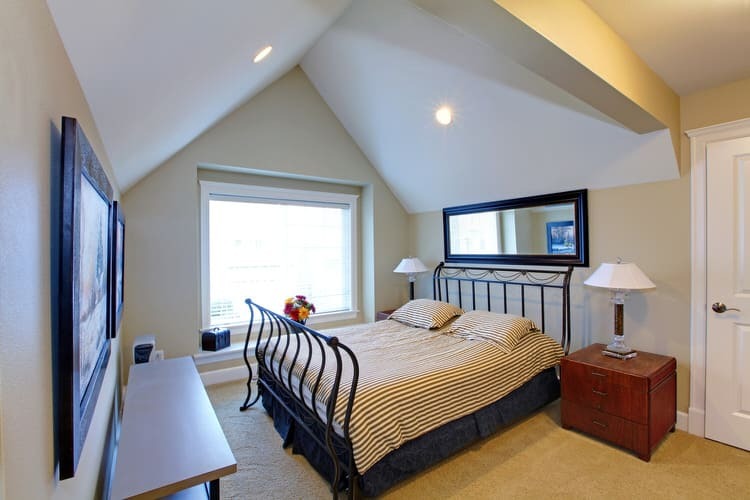 The angled ceiling of the attic bedroom adds height, but the space still feels a bit confined. Reversing the two-tone paint effect would help, as well as adding floating shelves and bedside tables. Retire the graphic bedding and replace it with a sumptuous white duvet cover and pile of fluffy white bed pillows. A low dresser and small chair in white could be added later. Create a focal point to divert your attention from cramped bedroom dimensions. This homemade headboard is strong but not overpowering. The tall, upholstered piece is framed in crown molding. It is the perfect spot for a splash of rich color by way of decorative pillows. 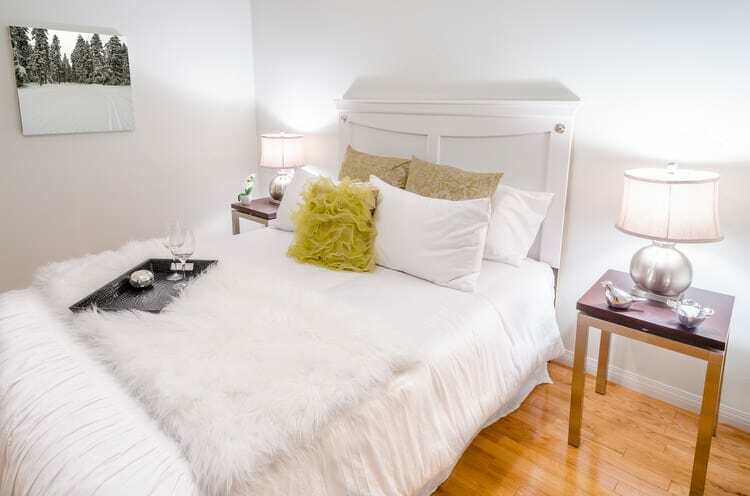 Use white on the walls and bed to make your tiny room grow in stature. Gauzy parachute bedding and a faux fur throw take this small bedroom from ordinary to extraordinary. The marble topped nightstands give plenty of surface space without taking up visual space. Shiny mercury glass lamps and silver accessories brighten the room. Sleigh beds are classic in design—defined by the gentle curve of the headboard and footboard. This stylish leather version is no exception. 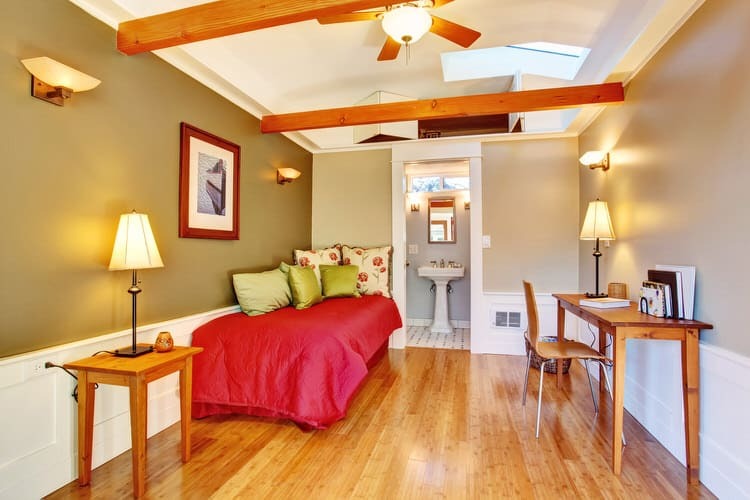 However, in this small guest bedroom, it completely overpowers the space. We need do eliminate this bulky beast and replace it with a headboard-only option. Save massive furniture pieces like this sleigh bed, for the master bedroom. Here comes the sun! 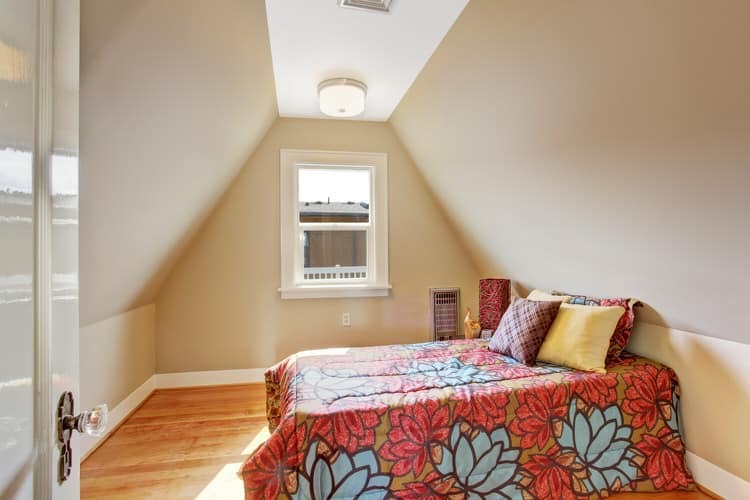 Embracing natural light will improve your mood and that of your small bedroom. The play of light and shadow uplifts the space and creates subtle contrast and depth. 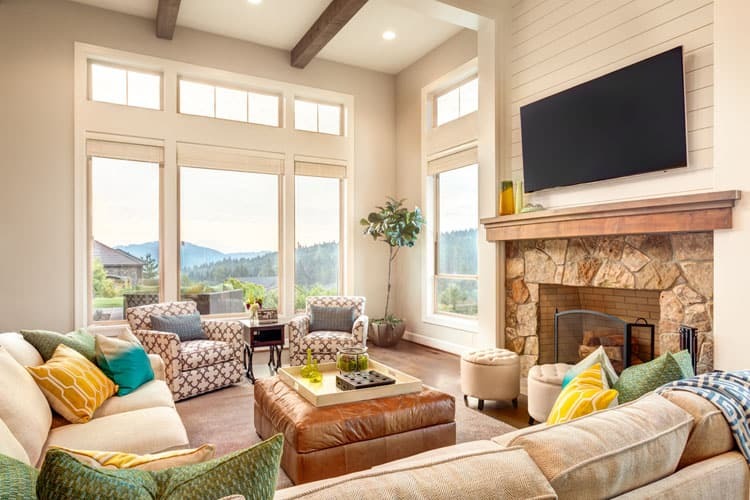 You can still use window coverings to enhance its style. Layer your windows with sheer panels and light-blocking shades for evening privacy, then throw open the curtains during the day. 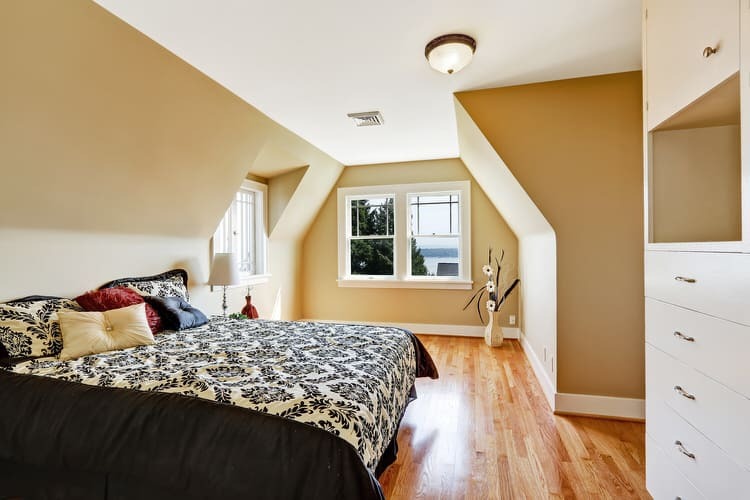 When it comes to color in an attic bedroom with pitched dormer walls, it is best to stay with a simple and neutral color palette. 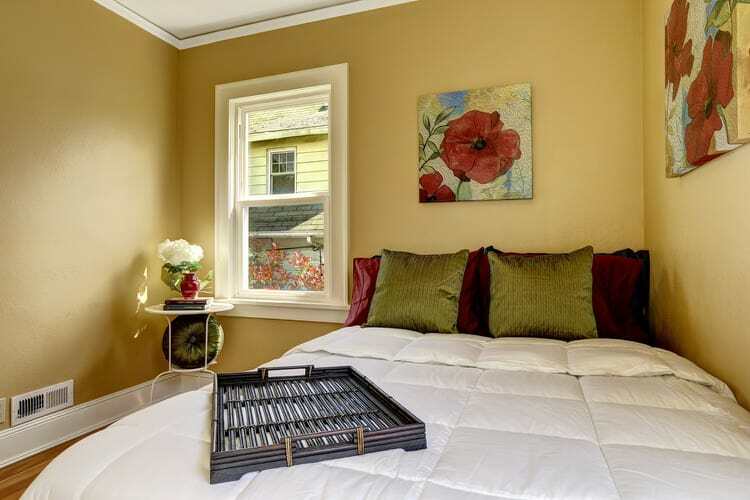 In this small bedroom, the homeowner went with a color scheme of tan and black to keep things clean and simple. The bright white ceiling expands the space along with the generous amount of natural light streaming in from the windows.